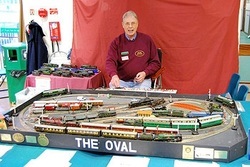 John H Ferrier, 4mm Scale/OO gauge, Hornby-Dublo 3-Rail. Taking its name from its general shape and John’s interest in cricket, this layout must be the dream of many children growing up in the 1940s/50s/60s, and modern youngsters who can visualise it in their bedrooms. Stocked mainly with the popular output from the Meccano factory where production ceased in 1964, this 3 rail Hornby Dublo table top layout features 18 all electric points, and 22 semaphore and colour light signals, controlling the main line and yard exits. Compacted on a single baseboard measuring 5’9” x 3’2” there is a peripheral main line encompassing numerous sidings and loco storage roads, the whole being divided into 30 electrical sections to maximise operating flexibility. Please ask if you wish to see a train of your choice run. Photographs by Peter Richards/Wadebridge Exhibition. 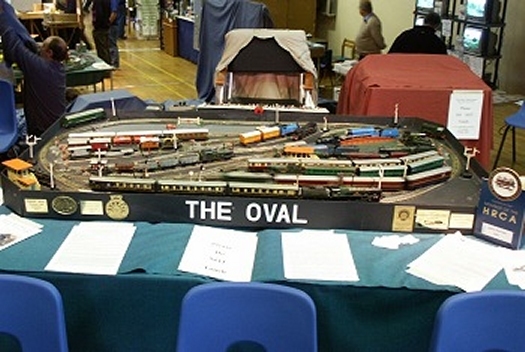 The Oval at Wadebridge in 2006.